OMGPOP’s Draw Something, as we’ve reported, has become a huge mobile gaming success, prompting a quick acquisition of OMGPOP by Zynga (s znga). And while I went into some of the factors for Draw Something’s success, one reason that may have gone overlooked is how well the game is doing in China, home to the second-largest download market for iOS (s aapl) apps after the U.S.
Now, it might not sound that interesting that Draw Something is doing well in China when many other top western apps are also hits there. According to App Annie, the free app was the 9th ranked iPhone game in the App Store in China and also the 9th-ranked paid game. Among iPad apps, Draw Something is ranked for 7th for paid and 12th for free games. Infinity Blade, Angry Birds Space and Fruit Ninja are also top ten apps in China. But stepping back, you realize this is for a game that is based on drawing English words and phrases, some of them slang terms. Almost all of the other top western hits on the Chinese charts are games, like Angry Birds, that need little localization support or can stand alone. But Draw Something is a huge hit (probably more than 50 million downloads worldwide at this point) even despite its language barrier in China and lack of localization. Consider the fate of Zynga’s other top With Friends games in China: Scramble with Friends, Words with Friends or Hanging with Friends do not appear on the top 300 paid or free iPhone or iPad charts. This might help explain why Zynga was willing to pay about $180 million for the company. China’s share of downloads has grown considerably, according to app analytics firm Distimo. From early 2011 to November last year, China’s share of combined iPhone app downloads between it and the U.S. went from 18 percent to 30 percent in the course of 10 months. And China recently surged past the U.S. in the number of free iPad app downloads. That’s key for companies like Zynga that make their money more from in-app transactions and advertising in free apps. I reached out to Dan Porter, the CEO of OMGPOP, to ask what he thought of the Chinese support for the game. He agrees it’s pretty surprising considering the game has had no marketing in China and is only available in English. He said that at one point last week it hit No. 1 in the App Store. “It’s so crazy that something like this is so far away in another language and they’re still finding a way to use it. That’s part of the way it grows, it’s enough of a blank slate, that people can do that,” Porter said. 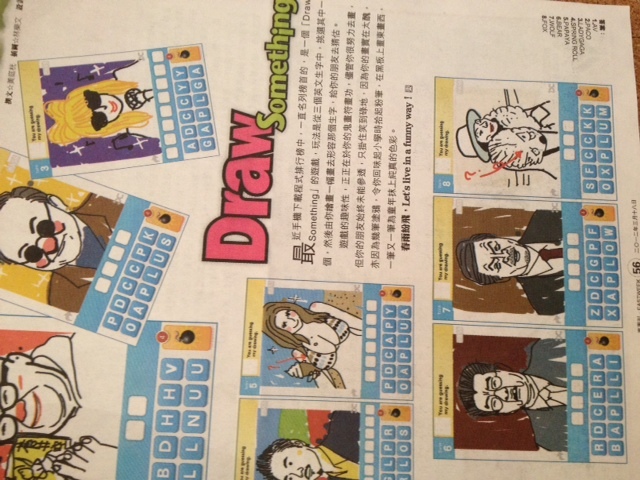 I came across an image of some Draw Something pictures out of Hong Kong, and they showed that despite the use of English words, the Chinese users were drawing pictures that would get recognized by fellow Chinese players. For example, for the word “Fox,” a drawer drew an image of a woman recently in the news for having an affair with a famous wealthy man. The slang for home wrecker in Chinese is “fox” spirit or demon. Porter can’t talk about future plans for tapping the China opportunity or just how many downloads there are in China. The game is built for English and with China’s character-based language, it would be harder to translate the game’s word guessing feature. But it could happen through Pinyin, a system of spelling Chinese words with English letters. For now, it’s a reminder of just how big the opportunity is in China and also how Draw Something’s simple approach for a drawing game can appeal to a wide audience. The game is less about competition but more about collaboration and communication. And with its open-ended style, people can use it for creatively expressing all kinds of words. I just read that there has been a huge decline in the use of the app which I feel is such a shame. I dont feel bad for the owners who made 180 million but more like sites like http://www.drawsomethingcheats.com that rely heavily on the users. But again Im sure the owners of Zynga will come up with a brilliant idea to reinvent the game. such a sweet game. hope it keeps growing like this! It’s really crazy how fast Draw Something has grew. I remember being one of the first thousand people to download it and none of my friends heard of it. Now they all play and I’m bored of it. It should be interesting to see if the competition starts making similar apps. Anyone know what or who is behind the coming soon app Draw Against Friends (http://drawagainstfriends.com)? Seems interesting…. Thank you for interesting article. “a drawer drew an image” seems to be an unusual choice of words.